Burundi’s military was restructured between 2004 and 2009 following the Arusha Peace and Reconciliation Agreement and the end of the 1993-2003 civil war. The military is required to have a 50/50 ethnic mix of Tusis and Hutus, including former rebels (until the 2001-2005 transition, the army had been dominated by Tutsis). The new National Defence Forces (FDN) are projected to number around 30 000 members. There is also a 20 000 strong National Police force. Although Burundi is landlocked, it has a small naval component that monitors its 175 km of shoreline along Lake Tanganyika. Burundi’s defence budget is relatively high in terms of % of GDP but in numerical terms is small as the country’s GDP is only $3.397 billion and per capital GDP $300. This means that little money is available for procurement and the serviceability of much of the military’s heavy equipment and aircraft is questionable. External •	Burundi is currently facing no external military threat. •	Due to Burundi’s military presence in Somalia the country could be targeted by Islamic extremists. Internal •	Internal instability is a possibility due to ethnic tensions lingering between the ruling Hutu majority and Tutsi minority. Regional •	Instability within the DRC could affect Burundi’s foreign security policy design. 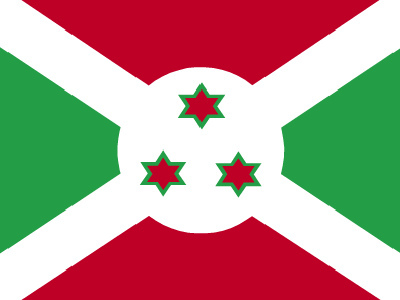 Political •	Political tension still lingers within Burundi due to its now finished civil war. Economic •	Agriculture accounts for 57% of Burundi’s economy and supports more than 70% of the country’s labour force. Instability within this sector could lead to political instability.